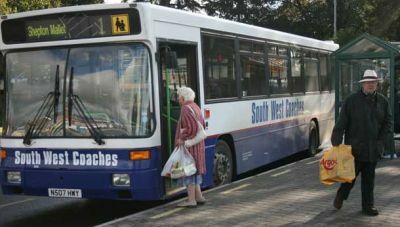 Mendip does have a comparatively good public transport system, and going by bus (if the bus is full) is one of the most energy efficient ways of travelling. Full bus timetables are available from most tourist information offices, libraries and bus stations. Alternatively, one call to traveline, or a visit to one of many websites, can now make planning your journey by public transport easy. Traveline is the one stop shop for public transport information. To plan your journey visit the site or call 0871 200 22 33. Transport Direct is a free online journey planner that will tell you door to door how to get somewhere without the use of a car if you wish. The Man in Seat Sixty One is a website packed full of information for anyone wishing to plan a trip without the use of an aeroplane. Compiled by a seasoned rail user it gives you information on when where and how much from the Eurostar to getting from the UK to Australia.